A new photo of first lady Melania Trump has begun to make rounds on Twitter again during the Super Bowl, reigniting the popular hashtag #FreeMelania. President Donald Trump gathered members of his administration and family in a ballroom at his Mar-a-Lago golf club to watch the championship game on Sunday. 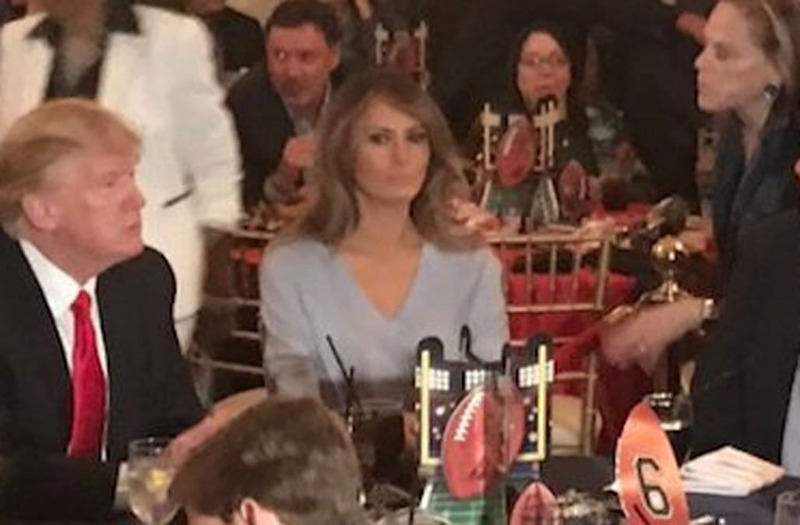 The first lady appeared to be disinterested in the game as she sat alongside Trump during the viewing in one photo snapped during the event, which immediately set Twitter users on fire with speculation about what motivated her facial expression. Probably the first First Lady to never actually WANT to move into the White House. Melania is the face of America these days. @Leafer1 @mikememoli @JoyAnnReid @POTUS And Melania STILL looks like a hostage! Maybe Mr. Clean will save her? @MelissaStetten Someone save Melania and Baron. LET MELANIA GO! And maybe Tiffany. Leave the rest, bye. @anamariecox Edit: "Save your *activism* for people whose lives are being destroyed." Melania made her choices. She *had* choices. @JoyAnnReid Melania with her resting "save me" face. Joyless bunch. @jeneps @Patta47cake @Reince @realDonaldTrump Melania looks miserable, as always, someone save her and send her back to her country. @michaelwhitney Melania is sending the "save me" face. Think we need to sneak her out while Trump tweets. @jeneps @Reince Some1 please save Melania, she has the look of the typical abused wife. The trending topic harkens back an earlier tweetstorm sparked by a video of Melania at the inaugural ceremony that initially prompted the hashtag #FreeMelania. The video shows Melania smiling at her husband during the inaugural ceremony, then appearing to scowl the moment he looks away.